As part of our preparations for the opening of our new school Carmel McLoughlin has researched the history of our school, most especially Bun National School which was the first state school built in this area. Lumcloon National School replaced Bun National School in 1964. Bun National School was built in 1885. The school was a one teacher school. In 1895 a Miss Bridget O’Grady Egan was the teacher. In 1943 Miss Griffith was teaching In Bun NS. The teachers came to school by bicycle. Some teachers stayed in Lynch’s in Cloghan which was also at one time a shop. Miss Coffey, another teacher who worked in Bun NS stayed in Coughlan’s house which is now owned by Tommy Butler and cycled to school as well. 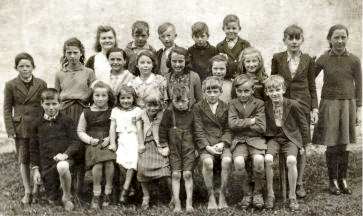 Among the teachers who taught in Bun NS were Miss Bridget O’Grady, Miss Griffith, Miss Coffey, Miss O’Grady, Miss Egan and Miss Claffey. Bun National School 1949 School began at 9.30 am every morning. Morning break was at 11.00 am and Lunch was at 1.00 pm until 1.30 om. There was another break at 2.00 pm for 5 minutes. The pupils played outside at break and the boys played football, hurling, tug of war and tig. The girls played tig, Ring a Rosie and skipping with a skipping rope. Most pupils brought a bottle of milk and a few slices of bread. School finished at 3.00 pm every evening. There was no running water or electricity at the time. The power station was only started in the 1950s. Each family had to bring in a few bags of turf once a year. As the entrance to the school was too narrow to bring a cart into the school grounds, every child brought an armful of sods from the bags on the road to a press inside the school in the hall. Fr. Murphy would visit the school every Friday testing on religion. Once a year a diocesan examiner visited the school. Between 25 and 28 pupils attended Bun NS at the most. There were six rows of tables in the classroom. Classes ranged from 1st to 6th. The teacher would sit up at the top of the classroom on a high desk. There two steps up to the desk. At the start of summer in May the children could take off their shoes and go everywhere barefoot and only put them back on at the start of September. Two boys were picked to light the fire each morning in winter. Magpies would build nests of sticks and mud in the chimneys. The boys would use these sticks and balls of paper to light the fire. Two girls would go to the pump on the main road each day with a bucket to fetch water for the teacher to make tea over the fire. The holidays were Christmas, Easter and summer. School opens at 9.30 am and John Bennett walked to school or sometimes got a lift with a Banagher Bantile lorry. The two boys lit the fire and everybody sat down and said their prayers. Then they did some lessons. The subjects covered were Irish, English, History, Geography and Catechism. The toilet was outside. Then after lessons there was a break for 10 minutes, then more lessons and second break was from 1.00 pm to 1.30 pm. Then there was more work and it was time to finish at 3.00 pm. A school inspector would call every few months. The Bishop used to come to the examine the pupils. One day the Bishop asked the children what “Grace” was. The reply he got was “Something you fry things on”. Special thanks to John Bennett and Seamus Egan for this information. Bun was my father’s school and my own first school. I still have a few distant memories of the classroom the slate & chalk and the noise. as we left Lumcloon in 1963 moving into Ferbane and eventually Portarlington. Although I’ve lived in Manchester for the last 40 years, I sometimes stop and look for the old school as we visit family in Lumcloon and or Kilcormack.